The vast literature proving the historic Jewish connection to the Land of Israel has been extensively manipulated and distorted as part of the Palestinian politics of nationalism. Propaganda, indoctrination, and socialization, both domestically and internationally, are essential parts of the strategy and tactics of asserting Palestinian nationhood and statehood. By appropriating to themselves the values, traditions, and historical facts that belong to the Jews, Palestinians have managed to fabricate a "legitimate" history and political traditions out of nothing while denying those of Israel. 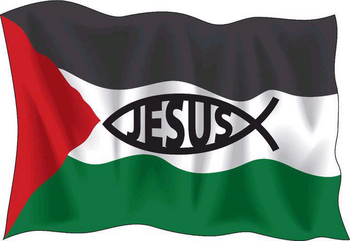 A Palestinian flag emblazoned with "Jesus." Not even Jesus's origin as a Jew is safe from the Palestinian fabrication of their history. While Jesus was certainly viewed for centuries as a Muslim prophet (along with Abraham and Moses), only recently has he become a model Palestinian shahid, a martyr to their cause. Nation-building often involves the invention of foundation myths although these normally require a certain relationship to historic facts, however tenuous. Palestinian leaders, under the leadership of Yasser Arafat and his successors, adopted a different tack: stealing the enemy's heritage, history, and values, and denying its legitimacy as a people and a state. The Palestinian objectives are to disqualify Israel's historical standing and to inherit its belongings by delegitimizing and even dehumanizing its national identity and personality. Palestinian tactics are simple yet sophisticated: preaching and dispersing lies and distortions of reality. History proves that the bigger the lie and the more common its reiteration, the more it is accepted as authentic and genuine. Moreover, most people are unwilling to accept the idea that an entire national leadership would dare to totally distort and fabricate history in full. Part of the Palestinians' success in doing so is also due to the fact that most people do not know the history of the Land of Israel and of Jerusalem. Rewriting the history of the Land of Israel by erasing Jewish history and replacing it with a fabricated Palestinian history is a central goal of the Palestinian Authority (PA) and something that the early generations of Palestinian leaders, including the notorious Hajj Amin Husseini, who led the Palestinian Arabs to their 1948 defeat, dared not do. This fictitious history, which ignores all historical documentation and established historical methods, is based on systematic distortions of both ancient and modern history with the aim of denying Israel's right to exist. The Palestinian leaders claim lineage from ancient history, describing the Canaanites as their direct ancestors. In the words of the PA president Mahmoud Abbas: "We said to him [Netanyahu], when he claimed the Jews have a historical right dating back to 3000 years B.C.E., we say that the nation of Palestine upon the land of Canaan had a 7,000-year history. This is the truth that must be said: Netanyahu, you are incidental in history. We are the people of history. We are the owners of history." According to Palestinian Authority historians, the Palestinian people has been living in Palestine for over seven thousand years. Another claim states that Palestinians were in the land since the beginning of creation. According to Sheikh Ikrima Sabri, chairman of the Supreme Islamic Council of the Palestinian Authority, Palestinians have roots in this land originating from earlier than 7500 B.C.E. Arab villages have allegedly existed since the days of the Canaanites. The "Arab" Canaanites supposedly established ports on the coast of Canaan, known today as Palestine, and Jaffa is said to have been one of the cities whose Canaanite origins later invaders failed to erase. Overall, the Palestinian people claim to be rooted in the region for thousands of years and long before Israel. According to this argument, some 6,000 years ago, the Palestinians of Canaan created a great civilization that, like the sun, was producing light and shining it on human beings as the Islamic religious basis of the world. Palestinian scholars and media have touted the claim that the Palestinian Arab nation has been rooted in its land for thousands of years since the human settlement of the "Arab-Palestinian-Canaanite" city of Jericho—the oldest city in the history of human civilization. In their claim, the history and heritage of Jericho confirm the Arab-Palestinian-Canaanite narrative concerning the entire Palestinian land, from the sea to the river, and negate the false Zionist narrative. Jericho allegedly proves that the Palestinian nation is the most ancient and earliest of all, whose roots are the most deeply dug into history. Palestinians also declared themselves to have been the center of historical events and peoples found in the Bible in the form of the Edomites, Amorites, Midianites, Amalekites, Ibrahim bin Azar (biblical Abraham), and al-Khadir (Prophet Elijah). In the view of the Palestinian ambassador to India, Adli Sadeq, to ignore the existence of the Palestinian people and its rights reflects a logic that mocks intelligence, culture, and the Bible itself, in which Palestine and its people are mentioned more than 250 times. Of course, the term Palestine appears nowhere in the Bible. The assertion that the Palestinians are descended from the biblical Jebusites, who, according to the Bible, were the original inhabitants of Jerusalem, has also been frequently made. The Qur'an declares that the Jews are the chosen people, exalted among the nations of the world. It clearly declares the Jews (Bani Israil) as the only owners of the Land of Israel, which is al-Ard al-Muqaddasah; al-Ard al-Mubarakah; Ard Bani Israil (the sacred land; the blessed land; the land of the People of Israel), and they are not allowed to leave it, for otherwise they will be punished: "It is the promise of God, and God does not go back on his promise." The Qur'an goes on to acknowledge that the Jewish first and second kingdoms existed but states that they were punished by God. Arab ownership of Palestine is also critically connected to exegesis on the Qur'anic description of Muhammad's Night Journey from Mecca to the "furthest mosque," which is juxtaposed with a verse on the destroyed Temple of the Israelites. The existence of that temple, however, though it had been acknowledged by officials of the Islamic religious endowment authority (waqf ) in their publicity materials from the 1920s and 1950s, was famously denied by Arafat in an exchange with U.S. president Bill Clinton. Another Palestinian tactic is aimed at co-opting Christianity. For the PA leaders, Jesus is defined as a Palestinian who preached Islam, thus denying not only Jewish history and Christian legitimacy but also strengthening ancient Palestinian history. According to this narrative, Jesus was a Muslim prophet, like all other Jewish-born figures, who was born in Bethlehem, lived in Nazareth, and moved to Jerusalem. Therefore, Jesus the messiah is a Palestinian par excellence, the son of Mary the Palestinian. The Virgin Mary, the woman of love and peace, is of the nation of Palestine, whose roots are grounded in the depths of history. Jesus is a shahid, a holy martyr of Islam, the only Palestinian prophet, and the first Palestinian shahid who was tortured in this land. In the official Palestinian narrative, the Palestinian people are authentic and indigenous while it is the Israelis who are the foreigners, invented, and sown in a land that is not theirs. According to Nabil Alqam, a PA historian, the Israeli state concerns itself with cultural theft and with stealing, distorting, and erasing the Palestinian heritage, which has a historical depth of 4,000 to 5,000 years. The state of Israel attempts to steal Palestinian symbols and to create a fake Israeli identity. In his book, Jerusalem, City of Allah, Yunes Amr, president of the al-Quds Open University, claims to disprove all Israeli connections and the history of the Jewish presence in Palestine, both historically and linguistically, by exposing the falsification of facts and affirming that the Palestinians are Arab Canaanites indigenous to the land. Throughout Palestinian media and education, all Israeli cities and areas are featured as Palestinian in origin, including Haifa, Acre, Ashkelon, Jaffa, Safed, Tiberias, Tel Aviv, Nazareth, the Sea of Galilee, Kiryat Shmonah, and the Negev. These are the "Palestinian homeland" or "occupied Palestine." Instilling these assertions and psychological worldview as facts among youth and in the political arena requires a multilevel process of socialization and indoctrination, beginning with the education system. Reinforcement is constant and all-pervasive: Palestine is continually represented as an area of 27,000 sq km, and an overwhelming Palestinian majority believes this is the truth. The Palestinians also portray Israelis of today as having no genetic, religious, cultural, or historical connections to the Jews of the past, who are supposed to have disappeared long ago. Issam Sissalem of the Islamic University in Gaza further claims that the biblical Hebrew tribes were in fact Bedouin. As such they were Arab tribes, and there is no connection between them and today's Israeli Jews, who are the descendents of Eurasian Khazars who converted to Judaism. The original Hebrew tribes were erased and ceased to exist, leaving no traces. Likewise, Jarir al-Qudwa, once educational advisor to Arafat, holds that the Israelites of the Bible were not only Arab tribes but were among the purest. Fathi Buzia, a PA political commentator, argues that Europe, led by Britain, founded Israel, creating and implanting a thieving, fabricated entity upon the Palestinian land, in order to get rid of Jews at home. Israelis are described as religious groups of imposters who were never Jews but part of a Zionist plot to occupy Palestinian lands and steal the Palestinian identity and cultural heritage. This is derided as the greatest crime ever committed against humanity with the aim of the Judaization of Palestine. Even the Hebrew language is said to be stolen from Palestinian Aramaic. The Israeli state creates "false names" for sites to "erase the Palestinian facts." It steals everything it lays its hands on "by means of terror," including music, food, clothing, and folk traditions, even falafel and humus. All the territory held by the state of Israel is occupied, and the Palestinians will not compromise on it. In the light of this, Palestinian commentators demand that Zionists must acknowledge publicly before the world that Jews have no connection to Palestinian Arab land. Zionist history is nothing more than invention and falsification, constituting a crude form of colonialism. Zionists are trying to create a fake history at the expense of a real Palestinian history so as to steal the history and the culture of the Palestinians. The alleged Zionist process of theft and usurpation is, in fact, precisely the official Palestinian policy toward Jewish history. The paradoxical fact is that Palestinian nationalism effectively owes its creation to Zionism, the Jewish national movement. Stimulated partially by the disintegration of the Ottoman Empire and the search for Arab national identities, the main lines of Palestinian nationalism developed during the 1920s and 1930s in reaction to and in contrast with Zionism. Though Palestinians claim descent from Canaanites, the fact is that there has never been any historical Palestinian state, nor any indigenous political system and institutions. The Land of Israel witnessed many conquerors over the course of its history, but in the last two thousand years since most of the people of Israel went into exile—albeit not without leaving an uninterrupted presence in the land—it was not the home of any indigenous political entity. Not only has there never been a Palestinian state and a Palestinian people, but there were no other political entities besides those established by invading forces, such as the crusading statelets or district capitals created by Umayyad and Abbasid caliphs. Perhaps the most conspicuous fact regarding the novelty of the Palestinian nation is that when it was within their power, the Arab leaders never seriously sought to create a Palestinian state during the 1940s, and after the establishment of the State of Israel, from 1948 until 1967, when the West Bank and Gaza were under Egyptian and Jordanian direct rule. Moreover, during that time all Arab leaders referred to the Palestinian issue as a refugee problem. They did not call for the creation of a Palestinian state for the Palestinian nation. Even after the 1967 Six-Day War, United Nations Resolution 242 of November 22, 1967, mentions only "refugees," not even "Arab refugees"—let alone a Palestinian people and a Palestinian state. Calls in earnest for a Palestinian state did not begin in the United Nations or elsewhere until the late 1960s or the early 1970s. Even today, as all Arab states pay lip service to the idea of a Palestinian state, and Palestinian leaders are treated as equals by their Arab counterparts, it is far from clear that a Palestinian state is a real priority. If the Palestinians are a people today, they are indeed a new invention. However, do they deserve a state? Establishment of a Palestinian state would rightly open the floodgates for the creation of numerous states based on both new and old national identities. The Kurds and the Berbers, for example, have lived for centuries in the Middle East. They are distinct and ancient peoples that were not invented in the full light of history, but unfortunately, their existence does not translate automatically into statehood. If it did, such a process of granting statehood to all peoples would begin to unravel the fabric of the modern Arab world. Arab leaders, especially under pressure from the Arab upheavals of 2011 show no enthusiasm for this. The important question is what Palestinians really want. What are the Palestinians' political objectives, and how do they wish to realize them? All their leaders' declarations and policies clearly show that they have never moderated their primary objective, which is to eliminate the State of Israel. From the Abadan ("never") rhetoric of the 1920s through 1948 to Arafat's "phased strategy," adopted at the June 1974 Palestinian National Congress, Palestinians still lay claim to a land "from the river to the sea." Palestinians appear unwilling to compromise, to recognize Israel as a Jewish state, or to accept an Israeli state on any territory they call Filastin. It is also evident that Palestinian political evolution is closely tied to Israel's territorial and political development in two continuous phases. The first emerged after Israel's independence in 1948 and differentiated the Palestinians as a social group of Arab refugees, also called "Palestine Arabs," and lacking obvious cultural, social, or political characteristics that distinguished them from their Arab kin, who largely reviled them. The second phase developed after the 1967 Six-Day War; Palestinians then became a political group seeking to develop a national identity during the period of global anti-imperial and anti-colonial ferment. But even as a Palestinian national identity has been developed and marketed, it is overwhelmingly founded on the negation of its rival, namely Jewish and Israeli identity, rather than on positive attributes or real history. Given this, how have Palestinians been so successful in disseminating their message in the international arena? What brings them the overwhelming political and financial support at the expense of so many nations and other peoples, such as the Kurds and the Berbers, who are denied the chance to establish a state? Part of the answer is perhaps the Palestinians' sophisticated ploy of telling all players what they want to hear. In the international arena, the Palestinians emphasize the ideologies of post-colonialism, post-modernism, and multiculturalism. They depict themselves as the victims of colonial Zionism that has stolen their land and express the wish to establish Palestine as a small or even a multicultural state. In Europe, where there is a high level of guilt and remorse about its own colonialist past, the Palestinians depict Israel as the last remnant of the bygone European colonialist era and directly blame Europe for the creation of the Jewish state. Israel is accused of occupying the land that belongs solely to the Palestinian people, and worse, Israel is accused of perpetuating Nazi methods and committing genocide against the Palestinians. These Palestinian accusations are supported by European intellectuals and leftists who feel remorse about the colonial era and who do not wish to be reminded any further about the Nazi atrocities. In the United States, where many feel guilt and remorse over historic racism, the Palestinians depict Israel as a racist state, which treats them in the same way as African Americans were treated. For human rights organizations, Israel is a cruel occupier that violates all human rights and freedoms of the Palestinians. In world public opinion, Israel is depicted as an oppressive society that perpetuates systematic extermination and ethnic cleansing. And to Palestinians and other Muslims, the prospect of a Palestinian state is represented as the creation of another proud Arab or pious Muslim state. The question remains why the international community accepts the Palestinians' claims regarding their fabricated past and the corresponding negation of the Jews. Oil, ignorance, anti-Semitism, and a politically correct unwillingness to offer any challenge to such falsehoods, all play a role. Still, it is difficult to recall a time in modern history when one group of people openly expressed such visceral animosity and hatred and declared its eagerness to eliminate a neighboring state and its people while the international arena ignored and, in fact, enabled and legitimized it. Palestinian Arabs, as opposed to Arabic-speaking residents, have not been in the area west of the Jordan River from the Islamic occupation, from the Ottoman Empire, or even from British rule since 1917. No Palestinian state has ever existed, and so, no Palestinian people has ever been robbed of its land. There is no language or dialect known as Palestinian; there is no Palestinian culture distinct from that of surrounding Arab ones; and there has never been a land known as Palestine governed by Palestinians at any time in history. For these reasons, Palestinians have been driven to fabricate a past by denying and expropriating that of Jews and Israel. Only after the Palestinian leadership comes to terms with Israel's legitimacy and recognizes it as a Jewish state can one begin discussing the emergence of a Palestinian state that lives in peace beside the State of Israel. David Bukay is a lecturer at the School of Political Science in the University of Haifa. All references from Palestinian Authority media are taken from Palestinian Media Watch. Palestinian al-Fath TV, May 14, 2011. Al-Ayyam (Ramallah), Sept. 11, 2006. Palestinian al-Fath TV, July 25, 2004. Al-Hayat al-Jadida (Ramallah), July 3, 2010. Palestinian al-Fath TV, repeatedly from 2005-07. Al-Hayat al-Jadida, Mar. 17, 2009, Dec. 11, 2011. Palestinian al-Fath TV, Feb. 20, 2011. Al-Hayat al-Jadida, Oct. 21, 2010. Ibid., Nov. 18, 2005, Dec. 19, 2011. David Wenkel, "Palestinians, Jebusites, and Evangelicals," Middle East Quarterly, Summer 2007, pp. 49-56. Qur: al-Baqarah, 2:47; ad-Dukhan, 44:32. Qur: al-Maidah, 5:21; al-A'araf, 7:137; Bani Israil, 17:104. Philip Mattar, "The Role of the Mufti of Jerusalem in the Political Struggle over the Western Wall, 1928-1929," Middle Eastern Studies, Jan. 1983, pp. 104-18; Muhammad Amin al-Husseini, Haqa'ik An Qadiyat Filastin (Cairo: n.p., 1957), pp. 115-9. See Yitzhak Reiter, Jerusalem and Its Role in Islamic Solidarity (New York: Palgrave Macmillan, 2008), pp. 1-2. Qur: al-Imran, 3:51-2; an-Nisa, 4:171; al-Maidah, 5:111. Qur: al-Baqarah, 2:127-8, 133; al-Imran, 3:84; Yunus, 10:71-2, 84. Palestinian al-Fath TV, Apr. 21, 2006; al-Hayat al-Jadida, Mar. 9, Oct. 28, 2006. Al-Hayat al-Jadida, Nov. 18, 2005; Palestinian al-Fath TV, May 12, 2009. Al-Hayat al-Jadida, June 24, Dec. 11, 2000, June 17, 2005, Oct. 28, 2006, Apr. 30, Nov. 18, 2008; Palestinian al-Fath TV, June 9, Dec. 24, 2009. Al-Hayat al-Jadida, Dec. 11, 2011. Palestinian al-Fath TV, Oct. 22, 2009. Palestinian al-Fath TV, Apr. 11, June 14, 24, Sept. 2, Nov. 1, 2011; al-Hayat al-Jadida, Jan. 31, June 17, 20, 2011. Palestinian al-Fath TV, May 16, June 11, 25, July 5, Aug. 12, 13, 19, 2010. Al-Hayat al-Jadida, Apr. 4, May 26, 2011; Palestinian al-Fath TV, May 23, 2011. Palestinian al-Fath TV, Dec. 7, 2010, Feb. 8, July 15, 2011; al-Hayat al-Jadida, May 15, July 1, 2011. Al-Hayat al-Jadida, Dec. 16, 2010, Apr. 4, May 16, July 5, Dec. 8, 2011; Palestinian al-Fath TV, Dec. 23, 2010. Al-Hayat al-Jadida, Aug. 18, 2011. Palestinian al-Fath TV, May 23, 2011. Daniel Pipes, "Mirror Image: How the PLO Mimics Zionism," National Interest, Fall 1994; idem, "Mirror Image: Palestinians Continue to Mimic Zionism," DanielPipes.org, Jan. 10, 2008. See, for example, Efraim Karsh, Palestine Betrayed (New Haven: Yale University Press, 2010), pp. 2-16; Fred M. Gottheil, "The Smoking Gun: Arab Immigration into Palestine, 1922-1931," Middle East Quarterly, Winter 2003, pp. 53-64; Arieh L. Avneri, The Claim of Dispossession, Jewish Land Settlement and the Arabs, 1878-1948 (Edison, N.J.: Transaction Publishers, 1982), pp. 162-80. U.N .Security Council, "Resolution 242 of November 22, 1967." See, for example, "10 Point Program," Palestine National Council, Cairo, June 8, 1974. "Political Program for the Present Stage Drawn up by the 12th PNC, Cairo, June 9, 1974," Journal of Palestine Studies, Summer 1974, pp. 224-5. James Minehan, Nations without States (Westport: Greenwood Press, 1996), index. Hanan Ashrawi, Palestinian legislator, al-Hayat al-Jadidah, Dec. 27, 2011; Issa Karake, minister of prisoners' affairs, al-Hayat al-Jadidah, Nov. 24, 2011; Bassam Eid, "Can a Bi-National State Be a Solution to the Middle East Conflict," Palestinian Human Rights Monitoring Group, Jerusalem, 2009. Fayez A. Sayegh, "Zionist Colonialism in Palestine," Research Center Palestine Liberation Organization, Beirut, Sept. 1965; Gilbert Achcar, "The Arab-Israeli War of Narratives," Open Democracy, London, Apr. 19, 2010. See, for example, Marwan Bishara, Palestine/Israel: Peace or Apartheid. Occupation, Terrorism and the Future (London: Zed Press, 2003); Ziyad Abu Ein, Palestinian Authority deputy minister of prisoners' affairs, interview, Palestinian Fatah TV, Oct. 6, 2011; al-Hayat al-Jadidah, Apr. 17, July 5, Oct. 3, 2011. See, for example, Occupation, Colonialism, Apartheid? A re-assessment of Israel's practices in the occupied Palestinian territories under international law (Cape Town: Human Sciences Research Council of South Africa, 2009); Jamal Dajani, "Israel: Occupation or Apartheid?" The Huffington Post (New York), Feb. 5, 2010; Uri Davis, Israel: An Apartheid State (London: Zed Books, 2002), pp. 55, 61. See, for example, "Israel and Occupied Palestinian Territories: The 2011 Report," Amnesty International, New York, accessed Mar. 12, 2012; "Israel/Occupied Palestinian Territories, Events of 2009," World Report 2010, Human Rights Watch, New York, accessed Mar. 12, 2012. See, for example, Ha'aretz (Tel Aviv), Oct. 31, 2009; Inter Press Service (Rome), Mar. 23, 2011; Asia News (Bangkok), Mar. 22, 2011. Related Topics: History, Palestinians | David Bukay | Summer 2012 MEQ receive the latest by email: subscribe to the free mef mailing list This text may be reposted or forwarded so long as it is presented as an integral whole with complete and accurate information provided about its author, date, place of publication, and original URL.